After 300 years of paper production, Sittingbourne Paper Mill was dismantled in 2011 to make way for a mixed-use development comprising 150 new-build homes, a new Morrisons superstore, leisure facilities and a new waterside park on the 7.6ha site. Dismantling of the historic Mill was bound to have a huge impact on local residents – it was, after all, one of the town’s largest employers. In addition to its location alongside a railway station, surrounded by food outlets and residential dwellings, the site also had a natural spring running through the middle of it, dictating a sensitive approach and the use of lowvibration equipment from our modern, extensive fleet of plant and machinery. The historic significance of the site and the materials encountered meant we were able to enjoy a huge recycling and recovery rate in excess of 95 per cent. As part of the process, we successfully recovered over 1.5m yellow London bricks. Due to the volume of salvage available from the site, we also produced a credit for our client. 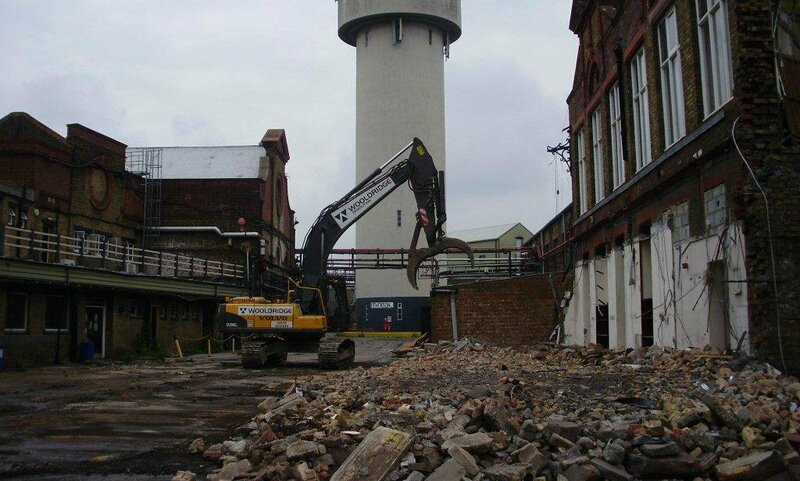 Removal of the site’s 34m tall water tower represents the final phase of demolition on the project. And to provide a fast, efficient solution that delivered the least impact to the developing site, the tower was blown-down in a controlled manner, using explosives.